A beautiful edition of Homer’s classic tale from Ancient Greece, vividly retold to delight modern readers. 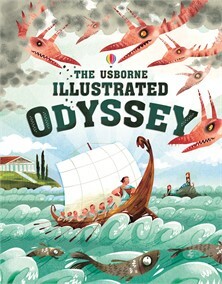 Dramatic, stylish illustrations bring to life brave Odysseus’ encounters with furious gods, bewitching goddesses, terrifying monsters and a man-eating Cyclops... A beautiful gift for any child who loves adventure stories. My granddaughter, age 5, loves this book. She is interested in religion and mythology and has asked for this book morning and night for the last two weeks. She has now "read" the whole book.